In 1870, Charles Neuhaus opened a small chocolate factory in Schaerbeek in the Brussels region. 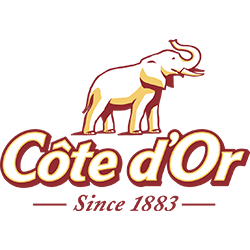 In 1883, he created the brand Côte d’Or which refers to the Gold Coast (Ghana), where many beans he used came from. Since that time, Côte d’Or takes the utmost cares in the selection of its cocoa beans and is based on an ancestral know-how (roasting, refining and conching) to ensure a high quality chocolate. Since 2005, Côte d’Or works with the Rainforest Alliance, a non-governmental organization (NGO). Its mission is to promote an agricultural model that improves the farmers’ livelihoods while protecting the environment. In 2013, Côte d’Or extends this certification to all its range of chocolate and ensures that at least 30 % of the cocoa is verified by this organization.